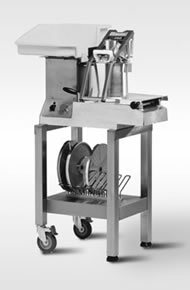 Able to handle any preparation job including slicing, french fry cutting, cubing, shredding and grating. This machine is designed for ease of operation, operator safety and food hygiene. Slice, dice, grate and cut large quantities of vegetables quickly, easily and efficiently. Capable of preparing 825 to 1450 lbs. of cut vegetables per hour. Includes large single feed hopper, handle pusher and standard ejector. H x W x D Ship Wt. Used for slicing onions up to 3" in diameter, making coin carrots or for slicing long vegetables. Load produce into hopper and it automaticall begins the cutting process. Cuts as fast as the operator can load the hopper.